This article is about the 2017 film. For the 1927 film, see The Ladybird (film). In 2002, Christine "Lady Bird" McPherson is a senior at a Catholic high school in Sacramento. She longs to attend a prestigious college in "a city with culture" despite her family's financial struggles, while her mother tells her she is ungrateful for what she has. Lady Bird and her best friend Julie join their school theater program, where Lady Bird meets a boy named Danny O'Neill. 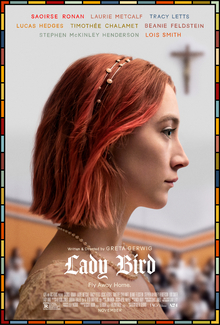 Lady Bird and Danny develop a romantic relationship, and, in a decision that disappoints her mother, she decides to spend the Thanksgiving before graduation with Danny's wealthy family instead of her own. Their relationship ends when Lady Bird and Julie discover their boyfriends kissing one other in a bathroom stall. At the behest of her mother, Lady Bird takes a job at a coffee shop; there, she meets Kyle, a young musician she recognizes from a show the previous semester, and the two begin dating. Jenna, a popular girl at the school, is reprimanded by a nun for wearing a short skirt, and Lady Bird suggests that she and Jenna bond by vandalizing the nun's car with a sign that reads "Just Married to Jesus". As Lady Bird grows closer to Kyle and Jenna, she gradually deserts Julie, and drops out of the theater program. She angrily confronts Danny, but turns to consoling him after he expresses his struggle in coming out. They become friends again. Kyle tells Lady Bird he is a virgin, and she loses her virginity to him, but he later denies having said anything of the sort. They break up. When Lady Bird is suspended from school, Jenna tries to visit her at home, but goes instead to Danny's grandmother's house, which Lady Bird had called her "dream house", and had claimed was hers. Lady Bird admits to the lie, and while Jenna agrees to forgive her because of their mutual friendship with Kyle, she ultimately loses her trust in Lady Bird. Lady Bird discovers that her father has lost his job and has been battling depression for years. She applies to East Coast colleges, despite her mother's insistence that the family would not be able to afford the fees. She is accepted into UC Davis, but is upset because she feels it is too close to home. She subsequently learns that she has been placed on the wait list for a New York college but does not share the news with her mother, fearing her response. Lady Bird sets out for her high school prom with Kyle, Jenna, and Jenna’s boyfriend Jonah, but the other three decide to go to a house party instead. Lady Bird changes her mind during the car ride and asks them to drop her off at Julie's apartment, where the two rekindle their friendship and go to the prom together. After Lady Bird's graduation, Danny accidentally reveals to Lady Bird's mother that she has been wait-listed, and her mother stops talking to her for the rest of the summer. On her eighteenth birthday, Lady Bird's father shares a cupcake with her. To celebrate reaching legal adulthood, Lady Bird buys a pack of cigarettes, a scratch-off ticket, and an issue of Playgirl magazine. She passes her driving test and repaints her bedroom. Lady Bird learns she has been accepted by the New York college, and can afford the tuition with financial aid and her father's help. Her parents take her to the airport, but her mother refuses to go inside to say goodbye. She has a change of heart and drives back, only to discover Lady Bird has already gone through security. Upon arriving in New York, Lady Bird finds several thoughtful letters in her luggage; her mother had written and discarded them, but her father had salvaged them. She begins using her birth name again. She is hospitalized after drinking heavily at a party. After leaving the hospital, she visits a Presbyterian Church during a service, then calls home and leaves an apologetic voicemail for her mother. Gerwig spent years writing the screenplay. At one point it was over 350 pages long, and had the working title Mothers and Daughters. In 2015, Gerwig and her team secured financing from IAC Films, who produced the film alongside Scott Rudin Productions. Gerwig's manager, Evelyn O'Neill, also served as a producer. Although the film has been described as "semi-autobiographical", Gerwig has said that "nothing in the movie literally happened in my life, but it has a core of truth that resonates with what I know". To prepare the cast and crew, Gerwig gave them her old high-school yearbooks, photos, and journals, as well as passages written by Joan Didion, and took them on a tour of her hometown. She told Sam Levy, director of photography on the film, that she wanted it to feel "like a memory," and said that she "sought to offer a female counterpart to tales like The 400 Blows and Boyhood." The film was Gerwig's first as a solo director; in 2008, she had co-directed Nights and Weekends with Joe Swanberg. In September 2015, Gerwig met with Saoirse Ronan at the Toronto International Film Festival, where they were promoting Maggie's Plan and Brooklyn respectively. They ran through the script in a hotel room, with Ronan reading the part of Lady Bird, and Gerwig reading the other characters. Gerwig realized by the second page that Ronan was the right choice for the lead. In January 2016, Ronan was cast. Gerwig met with Lucas Hedges and offered him his choice of the male parts. He chose Danny. Gerwig cast Laurie Metcalf after seeing her theater work; the rest of the cast—including Tracy Letts, Timothée Chalamet, Beanie Feldstein, John Karna and Jordan Rodrigues—was announced in September 2016. Principal photography was scheduled to begin in March 2016, but was delayed to August due to Ronan's commitments to a performance of Arthur Miller's The Crucible. Filming began on August 30, 2016 in Sacramento, California. Other locations included Los Angeles and New York City. Gerwig had wanted to shoot the movie on Super 16 film, but due to budget constraints ultimately shot on the Arri Alexa Mini. In post-production, the filmmakers emphasized digital noise to create the effect of a copy of a photograph. Ronan dyed her hair red for the role, and did not wear makeup to cover her acne; she has said she saw the film as "a really good opportunity to let a teenager's face in a movie actually look like a teenager's face in real life". Gerwig, using a technique she learned from the filmmaker Rebecca Miller, arrived an hour before everyone else to put the actors and crew at ease by knowing exactly how the day would run. She also banned smartphones on the set, a policy borrowed from Noah Baumbach. In July 2017, A24 acquired worldwide distribution rights to the film. The film had its world premiere at the Telluride Film Festival on September 1, 2017, and screened at the Toronto International Film Festival on September 8, 2017, and at the New York Film Festival on October 8, 2017. Focus Features acquired international distribution rights to the film. It was released theatrically in the United States on November 3, 2017, in the United Kingdom on February 16, 2018, and in Ireland on February 23, 2018. Lady Bird grossed $49 million in the United States and Canada, and $29.7 million in other territories, for a worldwide total of $78.6 million. In its limited opening weekend, it grossed $364,437 from four theaters, for a per-theater average of $91,109. It had the second best theater average of 2017, and the highest ever for a film in limited release directed by a woman. The film expanded to 37 theaters in its second weekend, and grossed a three-day total of $1.2 million, finishing tenth at the box office. In its third weekend, the film expanded to 238 theaters, and grossed a three-day total of $2.5 million, finishing eighth at the box office. The film had its official wide release on November 24, playing in 724 theaters and making $4 million over the weekend ($5.4 million over the five-day Thanksgiving frame), finishing eleventh. Expanding to 1,194 theaters the following week the film grossed $4.3 million, returning to eighth place. Lady Bird also became A24's highest-grossing film domestically, ahead of Moonlight, which made $27.9 million. The weekend of January 27, 2018, following the announcement of the film's five Oscar nominations, it made $1.9 million (an increase over the previous week's $1.1 million). Saoirse Ronan and Laurie Metcalf's performances garnered widespread critical acclaim and earned them Academy Award nominations for Best Actress and Best Supporting Actress, respectively. Lady Bird received a standing ovation at its international premiere at the Toronto International Film Festival, and was praised for Ronan and Metcalf's performances, and Gerwig's direction. On Rotten Tomatoes, the film has an approval rating of 99% based on 357 reviews, with an average rating of 8.7/10. The website's critical consensus reads "Lady Bird delivers fresh insights about the turmoil of adolescence and reveals debuting writer-director Greta Gerwig as a fully formed filmmaking talent." On November 27, 2017, the film became the most-reviewed film ever to remain at 100% on the site with 164 positive reviews, beating previous record holder Toy Story 2, which has 163 positive reviews. It stayed at 100% until the 196th review was negative. On Metacritic, the film has a weighted average score of 94 out of 100, based on reviews from 50 critics, indicating "universal acclaim." A.O. Scott of The New York Times described Lady Bird as "big-screen perfection ... exceptionally well-written, full of wordplay and lively argument. Every line sounds like something a person might actually say, which means that the movie is also exceptionally well acted." Todd McCarthy of The Hollywood Reporter wrote the film was "modestly scaled but creatively ambitious" and "succeeds on its own terms as a piquant audience pleaser", and gave praise to Ronan, whom he said "just seems to keep getting better all the time." Peter Debruge of Variety praised Gerwig's direction and script as well as Ronan's performance. Mick LaSalle of the San Francisco Chronicle wrote the film was "simply beautiful" and "warm and inspired", hailing the performances of Ronan and Metcalf as well as Gerwig's direction and screenplay. The Washington Post's Ann Hornaday described the film as a "triumph of style, sensibility and spirit" while similarly praising Ronan's performance and Gerwig's direction. Peter Travers of Rolling Stone rated the film 3.5 out of four stars in which he deemed it as "simply irresistible" and complimented the film's plot and narrative while highlighting the performances of Ronan and Metcalf in which he stated as an "Oscar calling" and Gerwig's direction as "full-blown triumph". He also declared it as one of the year's best films. Richard Roeper of the Chicago Sun-Times called the film "unique and original and fresh and wonderful" and "appealing" while lauding the performances (particularly Metcalf and Letts) in which he remarked that "There’s no level of acting on a higher plane than what [Metcalf] and [Letts] achieve in this film. This is what greatness looks like." Alonso Duralde of TheWrap remarked that "Gerwig the actress skillfully pivots between the wacky and the poignant, so it's no surprise that Gerwig the auteur so delicately balances hilarity and heartbreak". A BBC study described the film as the "most overrated by critics" among the 2018 Oscar nominees. This was based on the difference in aggregated scores given to it by critics and collated by Metacritic compared to the scores given to it by the public on the website IMDb. Lady Bird garnered a variety of awards and nominations. The film was chosen by the National Board of Review, the American Film Institute, and Time magazine as one of the top 10 films of 2017. At the 90th Academy Awards, it was nominated for Best Picture, Best Director and Best Original Screenplay for Gerwig, Best Actress for Ronan, and Best Actress in a Supporting Role for Metcalf; Gerwig became the fifth woman nominated in the Best Director category. It did not win in any of the five categories in which it was nominated. The film also received eight nominations at the 23rd Critics' Choice Awards, including Best Picture, Best Director, Best Actress, Best Supporting Actress, Best Original Screenplay, and Best Acting Ensemble. At the 75th Golden Globe Awards, it was nominated for Best Motion Picture – Musical or Comedy (won), Best Actress – Musical or Comedy for Ronan (won), Best Supporting Actress for Metcalf, and Best Screenplay. At the 24th Screen Actors Guild Awards, it was nominated for Outstanding Performance by a Female Actor in a Leading Role for Ronan, Outstanding Performance by a Female Actor in a Supporting Role for Metcalf, and Outstanding Performance by a Cast in a Motion Picture. In February 2018, on an episode of The A24 Podcast, Gerwig expressed interest in making spiritual successors to Lady Bird, saying "I would like to do a quartet of Sacramento films" modeled on the Neapolitan Novels of Elena Ferrante. ^ The nickname does not derive from former First Lady Lady Bird Johnson, but the Mother Goose nursery rhyme Ladybird Ladybird. ^ a b "Lady Bird (2017)". Box Office Mojo. Retrieved November 14, 2018. ^ Terry Gross (November 16, 2017). "Greta Gerwig Explores Mother-Daughter Love (And Angst) In 'Lady Bird'". Retrieved November 26, 2017. ^ a b Erbland, Kate (October 6, 2017). "Greta Gerwig Explains How Much of Her Charming Coming-of-Age Film 'Lady Bird' Was Inspired by Her Own Youth". Indiewire.com. Retrieved November 10, 2017. ^ a b "'Lady Bird': How Greta Gerwig Re-created 2002 to Tell Her Coming-of-Age Story". The Hollywood Reporter. Retrieved January 12, 2018. ^ a b Zuckerman, Esther (November 5, 2017). "How Greta Gerwig Turned the Personal 'Lady Bird' Into a Perfect Movie". Rolling Stone. Retrieved November 10, 2017. ^ Miller, Julie (November 3, 2017). "How Greta Gerwig's Lady Bird Came to "Look Like a Memory"". Vanity Fair. Retrieved November 10, 2017. ^ Desta, Yohana (November 4, 2017). "How Joan Didion Shaped the World of Greta Gerwig's Lady Bird". Vanity Fair. Retrieved November 10, 2017. ^ Raup, Jordan (November 1, 2017). "'Lady Bird' Cinematographer Sam Levy on Greta Gerwig, Frank Ocean, and Éric Rohmer". The Film Stage. Retrieved November 10, 2017. ^ Hans, Simran (February 18, 2018). "Lady Bird review – a magical portrait of adolescence". The Guardian. Guardian Media Group. Retrieved February 21, 2018. Lady Bird has been described as Greta Gerwig’s directorial debut. Yet, with ... a co-director credit on Joe Swanberg's 2008 mumblecore drama Nights and Weekends, it's not as though she is new to making movies. ^ Rottenberg, Josh (September 3, 2017). "Greta Gerwig talks about her directorial debut and casting Saoirse Ronan in 'Lady Bird'". Los Angeles Times. Retrieved November 10, 2017. ^ Radish, Christina (November 8, 2017). "Greta Gerwig on 'Lady Bird' and What Made Saoirse Ronan Perfect for the Title Role". Collider. Retrieved November 10, 2017. ^ McNary, Dave (January 22, 2016). "Saoirse Ronan starring in Greta Gerwig's Drama Lady Bird". Variety. Retrieved September 28, 2017. ^ McHenry, Jackson (November 8, 2017). "Lucas Hedges Is Obsessed With His Lady Bird Co-stars, and Kept His Puka Shell Necklace". Vulture.com. Retrieved November 10, 2017. ^ Hirschberg, Lynn (November 2, 2017). "Lucas Hedges Confesses He Was Almost Thrown Out of Madonna's Oscars Party". W Magazine. Retrieved November 10, 2017. ^ Sperling, Nicole (November 2, 2017). "Lady Bird's Laurie Metcalf on the Mom Role That Hit Close to Home and Roseanne's Revival". Vanity Fair. Retrieved November 10, 2017. ^ N'Duka, Amanda (September 15, 2016). "Greta Gerwig's 'Lady Bird' Adds Jordan Rodrigues; Cailee Spaeny Cast In 'Pacific Rim: Maelstrom'". Deadline Hollywood. Retrieved September 15, 2016. ^ McCarthy, Lauren (November 2, 2017). "Lady Bird's Beanie Feldstein Has Boundless Potential (and the Enthusiasm to Match)". W Magazine. Retrieved November 10, 2017. ^ Coggan, Devan (December 11, 2017). "Greta Gerwig wants to hug every Lady Bird crew member after Golden Globe nominations". Entertainment Weekly. Retrieved December 11, 2017. ^ "Lady Bird". Backstage. Retrieved September 8, 2016. ^ Gerwig, Greta; Jenkins, Barry (February 28, 2018). "All the Way Home with Barry Jenkins & Greta Gerwig" (Podcast). a24. ^ Miller, Julie (November 9, 2017). "Saoirse Ronan Reveals the Secrets Behind Her Stunning Lady Bird Transformation". Vanity Fair. Retrieved November 10, 2017. ^ Minow, Neil (November 1, 2017). "Greta Gerwig on "Lady Bird"". The Huffington Post. Retrieved November 10, 2017. ^ Fleming Jr, Mike (July 18, 2017). "A24 Lands Worldwide Rights To Greta Gerwig-Directed 'Lady Bird". Deadline Hollywood. Retrieved July 18, 2017. ^ "Lady Bird". Toronto International Film Festival. Archived from the original on June 12, 2018. Retrieved November 10, 2017. ^ "Lady Bird". New York Film Festival. Retrieved November 10, 2017. ^ "Focus Takes International Rights on Saoirse Ronan's Lady Bird". Variety. Retrieved September 12, 2017. ^ D'Alessandro, Anthony (September 22, 2017). "Greta Gerwig's 'Lady Bird' Going a Week Earlier in November". Deadline Hollywood. Retrieved September 22, 2017. ^ Connick, Tom (November 8, 2017). "What the critics have to say about hyped indie film 'Lady Bird'". NME. Retrieved November 11, 2017. ^ Brian Brooks. "Greta Gerwig's 'Lady Bird' Takes Year's Best Per Theater Average Of $93K – Specialty Box Office". Deadline Hollywood. Retrieved November 5, 2017. ^ Joanna Robinson. "How Greta Gerwig's Lady Bird Just Took a Big Leap Forward in the Oscar Race". Vanity Fair. Retrieved November 6, 2017. ^ Anthony D'Alessandro (November 11, 2017). "'Daddy's Home 2' Higher Than 'The Orient Express' In A 'Ragnarok'-Ruled Weekend – Early Sunday AM Update". Retrieved November 11, 2017. ^ D'Alessandro, Anthony (November 20, 2017). "Can 'Coco' Whip 'Justice League' For Top Spot Over Thanksgiving Stretch? – Box Office Preview". Deadline Hollywood. Retrieved November 20, 2017. ^ D'Alessandro, Anthony (November 26, 2017). "Thanksgiving B.O. At $268M, +3% Over 2016 Spurred By 'Coco' & Holdovers". Deadline Hollywood. Retrieved November 26, 2017. ^ D'Alessandro, Anthony (December 3, 2017). "'Coco' Looking At Sweet $26M+ As Specialty Sector Pops With Awards Contenders – Sunday Final". Deadline Hollywood. Retrieved December 3, 2017. ^ Nordine, Michael (December 24, 2017). "'Lady Bird' Is Now A24's Highest-Grossing Film, Surpassing 'Moonlight'". IndieWire. Retrieved December 29, 2017. ^ "Lady Bird Director Greta Gerwig knew right away that Saoirse Ronan was right for the job". TheWrap. Retrieved September 11, 2017. ^ "'Lady Bird': Film Review | Telluride 2017". The Hollywood Reporter. Retrieved September 8, 2017. ^ a b Debruge, Peter (September 4, 2017). "Telluride Film Review: Saoirse Ronan in 'Lady Bird'". Variety. Retrieved September 8, 2017. ^ "Lady Bird (2017)". Rotten Tomatoes. Fandango. Retrieved March 18, 2019. ^ "'Lady Bird' sets Rotten Tomatoes record as best-reviewed movie of all time". Entertainment Weekly. November 27, 2017. Retrieved November 27, 2017. ^ Sharf, Zack (December 11, 2017). "'Lady Bird' No Longer Has a Perfect 100% on Rotten Tomatoes (and Nobody is Happy About It)". IndieWire. Retrieved March 5, 2018. ^ "Lady Bird Reviews". Metacritic. CBS Interactive. Retrieved February 14, 2018. ^ "Review: Greta Gerwig's 'Lady Bird' Is Big-Screen Perfection". The New York Times. October 31, 2017. Retrieved November 21, 2017. ^ "'Lady Bird:' Film Review Telluride 2017". The Hollywood Reporter. Retrieved October 30, 2017. ^ LaSalle, Mick (November 8, 2017). "Gerwig's 'Lady Bird' is warm and inspired". San Francisco Chronicle. Retrieved December 8, 2017. ^ "Greta Gerwig makes a triumphant debut as a solo director with 'Lady Bird'". The Washington Post. Ann Hornaday. November 8, 2017. ^ Travers, Peter (October 31, 2017). "'Lady Bird' Review: Greta Gerwig's Coming-of-Age Story Is Simply Irresistible". Rolling Stone. ^ Richard Roeper (November 9, 2017). "Greta Gerwig's 'Lady Bird' so appealing, we can't wait to see her next". Chicago Sun-Times. Retrieved November 9, 2017. ^ Duralde, Alonso (November 3, 2017). "'Lady Bird' Film Review: Greta Gerwig Crafts a Lovely Portrait of the Artist as a Young Woman". TheWrap. Retrieved December 8, 2017. ^ Clara Guibourg (March 3, 2018). "Oscars 2018: Lady Bird is 'most overrated' nominated film by critics". BBC News. Retrieved August 8, 2018. ^ "Best of 2017: Film Awards and Nominations Scorecard". Metacritic. Retrieved January 3, 2018. ^ a b CNN, Sandra Gonzalez,. "Greta Gerwig's best director nomination is a huge deal". CNN. Retrieved March 2, 2018. ^ Hammond, Pete (December 6, 2017). "Critics' Choice Awards Nominations: 'The Shape Of Water' Leads With 14; Netflix Tops TV Contenders". Deadline Hollywood. Retrieved December 7, 2017. ^ Desta, Yohana. "Greta Gerwig Is Planning a Series of Spiritual Sequels to Lady Bird". HWD. Retrieved March 30, 2018.